Updating LinuxCNC for example from 2.7.0 to 2.7.1 and your PC is connected to the internet is an automatic process. You will see an update prompt after a minor release along with other software updates. If you don’t have an internet connection to your PC see Updating without Network. This section describes how to upgrade LinuxCNC to version 2.7 from version 2.6. It assumes that you have an existing 2.6 install that you want to update to 2.7. To upgrade LinuxCNC to version 2.7 from a version older than 2.6, you have to first upgrade to 2.6, then follow these instructions to upgrade to 2.7. If you do not have an old (pre-2.7) version of LinuxCNC to upgrade, then you’re best off making a fresh install of 2.7 as described in the section Getting LinuxCNC. To upgrade major versions like 2.6 to 2.7 when you have a network connection at the machine you need to disable the old linuxcnc.org apt sources and add a new linuxcnc.org apt source for 2.7, then upgrade LinuxCNC. You should be running on Debian Wheezy (as above), or Ubuntu Precise, or Ubuntu Lucid. Click on Applications Menu, then System, then Synaptic Package Manager. In Synaptic, click on the Settings menu, then click Repositories to open the Software Sources window. Click on the Dash Home icon in the top left. In the Search field, type "software", then click on the Ubuntu Software Center icon. 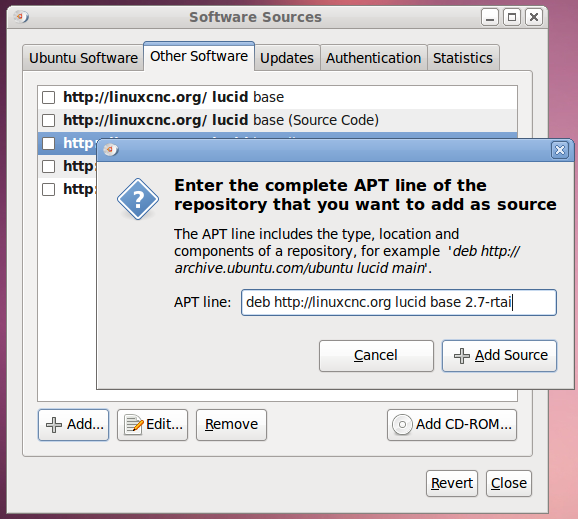 In the Ubuntu Software Center window, click on the Edit menu, then click on Software Sources... to open the Software Sources window. Click the System menu, then Administration, then Synaptic Package Manager. In the Software Sources window, select the Other Software tab. Delete or un-check all the old linuxcnc.org entries (leave all non-linuxcnc.org lines as they are). Click Add Source, then Close in the Software Sources window. If it pops up a window informing you that the information about available software is out-of-date, click the Reload button. Now your computer knows where to get the new version of the software, next we need to install it. The process again differs depending on your platform. Debian Wheezy and Ubuntu Lucid both use the Synaptic Package Manager. Open Synaptic using the instructions in Setting apt sources above. Use the Search function to search for linuxcnc. Click the check box to mark the new linuxcnc and linuxcnc-doc-* packages for upgrade. The package manager may select a number of additional packages to be installed, to satisfy dependencies that the new linuxcnc package has. Click the Apply button, and let your computer install the new package. The old linuxcnc package will be automatically upgraded to the new one. In the Search field, type "update", then click on the Update Manager icon. Click the Check button to fetch the list of packages available. Click the Install Updates button to install the new versions of all packages. You have to drill down from the above link to find the correct deb for your installation. Open a terminal and type in lsb_release -ic to find the name of your OS. Pick the OS from the list then pick the major version you want like 2.7-rt for real time or 2.7-sim for the simulator only. Next pick the type of computer you have i386 for 32 bit and amd64 for 64 bit. LinuxCNC version 2.7 differs from version 2.6 in some ways that may require changes to your machine configuration. If you have Mesa hardware the Hostmot2 watchdog now gets handled by the hm2 write Hal function. Remove any addf lines that refer to the pet_watchdog function from your main hal file. The Hostmot2 dpll’s default time constant has been changed from 40960 to 2000. The original value could occasionally lead to following errors when software like ntpd and ntpdate adjusted the rate of the linux CLOCK_MONOTONIC time source by up to 1000ppm in a single step. The new value allows the dpll to adjust to the change in the base period frequency without error. If you use the Parallel Port driver there are some changes. Older versions of the LinuxCNC hal_parport driver conflicted with the Linux parport_pc driver. This required two mitigation techniques, prevent parport_pc from loading, and load another LinuxCNC driver called probe_parport before loading hal_parport. The LinuxCNC hal_parport driver now cooperates well with the Linux parport_pc driver, and these mitigation techniques are no longer needed or useful. In 2.7, the probe_parport driver has been removed from LinuxCNC. Make sure your Hal configuration does not have loadrt probe_parport in any .hal file. A driver for the Huanyang family of VFDs was added to LinuxCNC 2.7. Before 2.7, the Huanyang VFD driver was maintained separately from LinuxCNC. If you use a Huanyang VFD and are switching to the LinuxCNC version of the driver, you’ll need to make a few changes to your HAL config.